One of the favorite breakfast treats is pan de sal (literally salt bread in Spanish), a bread made up of flour, egg, yeast, sugar and salt. It is sometimes filled with margarine, butter, fruit jam or hotdogs, fried eggs and bacon. Some Filipinos dip pan de sal into hot coffee. Fresh pan de sal can be bought at a neighborhood bakery or packaged ones at groceries. Whether filling a pan de sal or sliced bread, combined with rice or on their own, eggs, chorizo, hotdog, tocino, bacon or corned beef are favorites especially for growing children. As strange as it may sound, many Filipinos have rice as part of breakfast meals, eaten along with sardines, dried fish or left from last night’s dishes. Sometimes rice is fried with garlic, seafood and other add-ons. A slight variation is champorado which is basically rice porridge blended with chocolate. 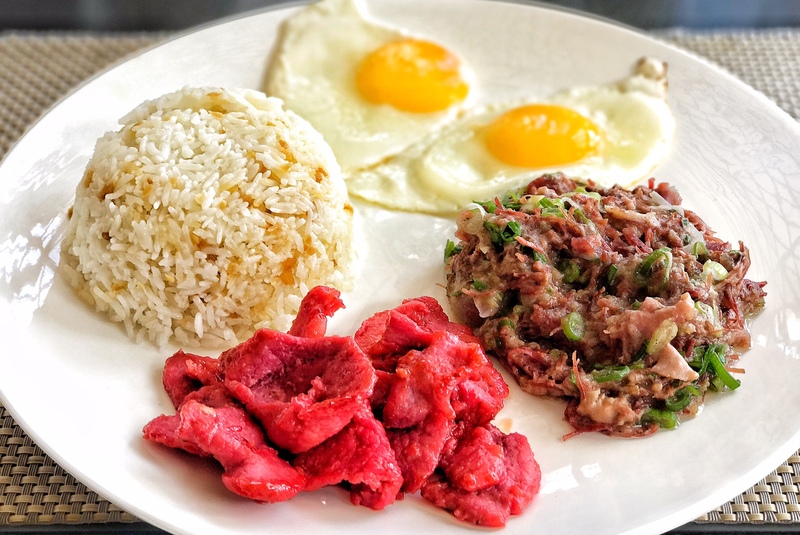 With the popularity of rice, garlic rice-inspired portmanteaus have become well-known breakfast orders: tapsilog (tapa + fried rice + fried egg), tocilog (having tocino as the meat portion), and longsilog (having longganisa as the meat portion), hotsilog (with a hot dog), bangsilog (with bangus (milkfish)), dangsilog (with danggit (rabbitfish)), spamsilog (with spam), adosilog (with adobo), chosilog (with chorizo), chiksilog (with chicken), cornsilog (with corned beef), and litsilog (with lechon/litson). Common drinks served during breakfast include milk (especially for children), black coffee for adults and fruit juices from powder or concentrates.